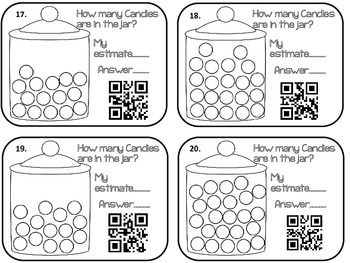 This is a set of 7 printer friendly worksheets with QR Codes. They can be printed as worksheets or printed onto card stock, laminated and cut into task cards. 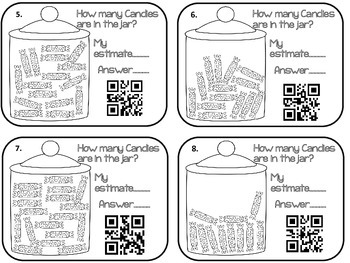 Students must look at the jar of candy and record their estimate of how many they think are in the jar. They can then scan the QR code and the answer will pop up! 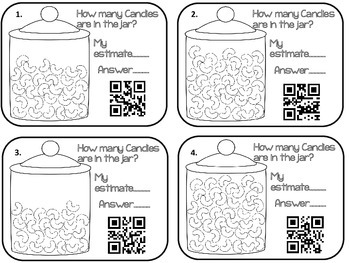 If you don't have a mobile device with a QR scanner, you can still use these sheets. 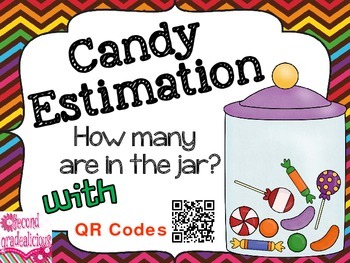 Students can count the candies and record the answer on the allotted spot instead. An answer key is included as well as a recording page. These worksheets could also be printed, cut into cards and laminated for long term use. Students can use a dry erase marker to write on the laminate and then use the provided recording sheet to record their answers.